The Library provides a wide selection of online resources to meet curriculum and research needs at Sheridan. In fact, the majority of our collections are online! Whether you are looking for a book, a journal article, a video, a statistic, or a business report, there's a good chance you can find one online in our collections. To access our online collections from anywhere, all you need is an internet connection & your Sheridan ID and password. How do I find online books, articles, etc.? Find online ebooks, journal articles, newspaper articles, and more from the library website. 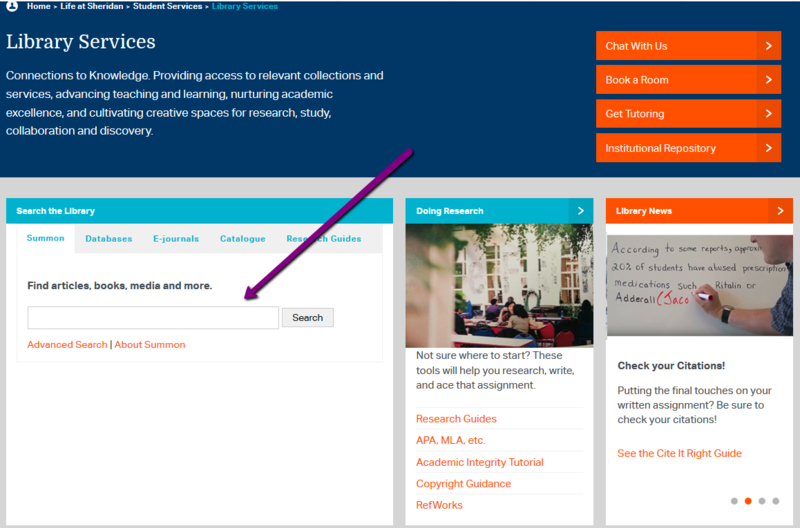 Try the search box in the 'Search the Library' box on the library homepage. We call this search box "Summon". Library databases are sites or collections the library subscribes to, on behalf of students. Like any other database, they offer a "collection of data or information organized for rapid search and retrieval" (Britannica Concise Encyclopedia). We link to more than 200 different collections and sites from a wide variety of publishers. Some focus on specific types of sources (books, journals, etc), and other focus on specific subject areas (business, education, etc). Find a list of all of our databases in the Databases A-Z list. If you are new to library databases, and don't know which one is best for your topic, browse our Research Guides. Research Guides are created by library staff and point to the best resources for specific programs and courses. How do I find the full-text? To see only titles where we have the full-text, select the Full-Text filter in Summon, or any journal database. Can Sheridan alumni access databases? Due to licensing restrictions, only members of the Sheridan community with a current enrollment are able to access our collections. Can I share Sheridan e-resources with friends or family outside of Sheridan? Due to licensing restrictions, the information within our databases can only be used by members of the Sheridan community for research, study, and education.